“If there is a bigger word for overwhelming, then I would use it! Name an emotion and we experienced it… the roller coaster that is autism diagnosis,” says Katie about the journey of assessments and diagnosis she and her family have been on for the past few years. From birth, every child develops at it’s own pace. From the first smile to sitting and crawling, there is so much happening in the first few years of a child’s life. Some children walk and talk before their first birthday while others may take much longer to reach those milestones in development. This is what makes early intervention so challenging. Because when is a child simply taking longer to develop certain skills and when is it time to take action? For five year old Harry and his family, the path to diagnosis and finding the right support was long and bumpy. “It felt like we had hurdles for a long time,” his mum Katie says. In their search for answers the family continued to push doctors for checks and tests to help their young son. “His sleeplessness was initially thought to be fructose or lactose intolerance, so we went down that path,” Katie goes on. The lengthy tests over multiple appointments were challenging for a young child with food issues and behavioural issues, Katie explains, but the results did show some reaction. The next step on the path to diagnosis for Harry was speech therapy, because at age 3 his speech was clearly lacking. However, as Katie explains, there was little improvement and the sessions were challenging because of Harry’s behaviour. Eventually, after several months of waiting for the referral and appointments, Harry was diagnosed with Autism Spectrum Disorder (ASD) at 3.5 years of age. And it wasn’t until he was almost 4 before he would sleep uninterrupted through the night, and only after he was finally prescribed Melatonin. After the diagnosis of ASD, it was recommended Harry started Applied Behavior Analysis (ABA) Therapy. ABA therapy uses a play-based technique of modelling appropriate behaviours to teach children new skills and behaviours and is widely recognised as having positive outcomes for those on the autism spectrum. Over time it can improve social, communication, academic and daily living skills, and reduce difficult behaviour. Katie explains that through a Verbal Behavior Milestones Assessment and Placement Program (VB-MAPP) assessment, which assess language, learning and social skills, the gaps in Harry’s abilities were discovered. “ABA Therapy is the only therapy Harry is currently having. It is intensive but we have had some promising results,” Katie goes on. 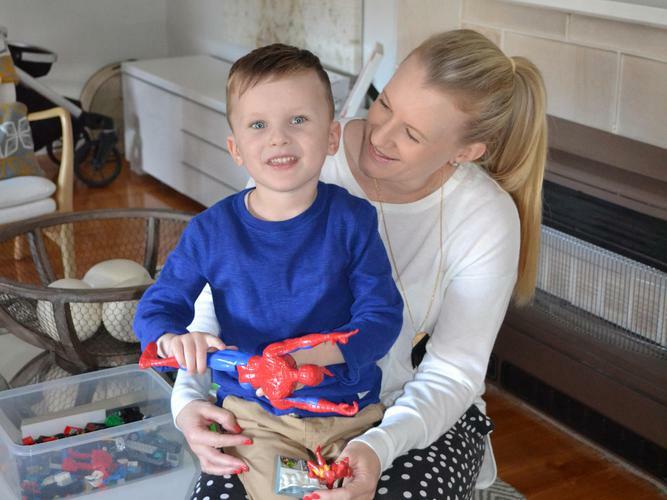 "Harry has around 6 sessions a week with his ABA Therapist/s, they come to the house and we go to the clinic once a fortnight to check in with his Therapist Supervisor. It’s a bit tricky with a younger sibling when the sessions are at home, and me working part-time, but all the juggling will hopefully be worth it, when we look back.... you don’t get a second chance at Early Intervention!" “Our son loves his therapy and his therapists. It’s all play based and we are glad we went down the ABA path,” she adds. Whilst it has been a rocky road, things have settled down a little now for Harry and his family. “Honestly, it’s all been quite a struggle,” Katie says. “As any parent with special needs kids knows it puts pressure on you personally, professionally, on the family, marriage and relationships. But she stresses the importance of reaching out, finding support and information, and advocating for your child. “Reach out for support, every.single.day if you need to. Ask lots of questions, seek advice, push the professionals,” she says. Katie’s advice is to try different things. “What do you have to lose? What if it makes a difference? If not, move on and find something that you are content with. Through it all it has been their support network that has helped Harry and his family manage on a day to day basis. “Connecting with other families on the same journey also makes you feel less like your life is so very different from lots of others,” she adds.